The Luangwa River; the other bank belongs to Muchinga Province. Muchinga Province is one of the ten provinces of Zambia. It is located in the northeast of the country and borders with Tanzania in the north, Malawi in the east, Eastern Province in the south, Central Province in the southwest, Luapula Province in the west, and Northern Province in the northwest. The administrative center of the province is Chinsali. The name of the province originates from the Muchinga Escarpment, on which it predominantly sits. 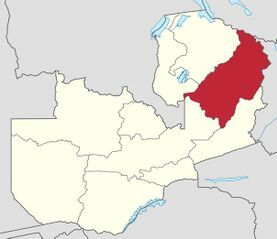 The province is elongated from southwest to northeast and is located on both sides of the Muchinga Mountains (Muchinga Escarpement), which serve as a divide between the drainage basins of the Zambezi River (Indian Ocean) and the Congo River (Atlantic Ocean). The main rivers of the province are the Luangwa River, a major left tributary of the Zambezi, and the Chambeshi River, a tributary of Lake Bangweulu, in the drainage basin of the Congo. The source of the Luangwa is located in the province. Three national parks are located in the province. There are Lavushi Manda National Park, North Luangwa National Park, and South Luangwa National Park. The latter is shared with Eastern and Central Provinces. The creation of a province was announced by President Michael Sata in October 2011. In November 2011, the president appointed Malozo Sichone as Muchinga Province Minister. The parliament approved the creation of the province at some later date. The province consisted originally of five districts. Chama District was transferred from the Eastern Province, and the Chinsali, Isoka, Mpika and Nakonde districts were transferred from the Northern Province. In 2013, Mafinga District was created by splitting Isoka District and Shiwa-Ngandu District was created by splitting Chinsali District bringing the total number of districts to seven. The TAZARA Railway which connects Kapiri Mposhi and eventually Lusaka with Tanzania crosses the province from southwest to northeast. A road connecting Lusaka with Tanzania runs through the province, passing Mpika and Isoka. In Mpika, another major road branches north to Kasama. Chama is connected with Lusaka by a different road which follows the Luangwa River and passes Petauke and Nyimba, connecting to the Great East Road. This page was last edited on 14 July 2016, at 16:42.